The magician displays a Bouquet of 5 white flowers. As he plucks them one by one, he is left with a bunch of stems and leaves. Suddenly the bunch begins to swell, and small, multi-colored buds inexplicitly appear on the stems. 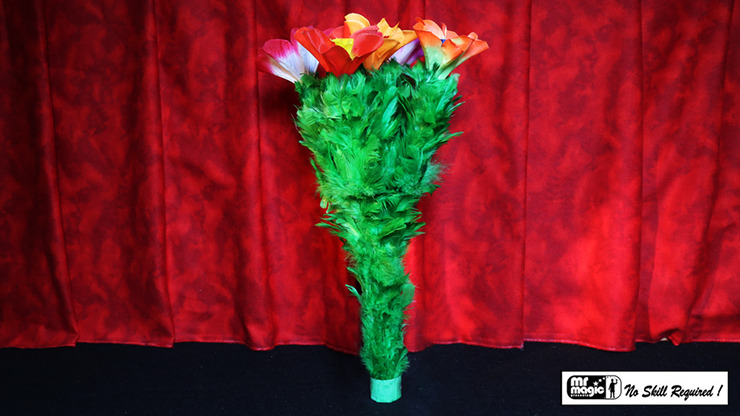 The buds continue to grow, bigger and bigger, until the magician is holding a beautiful, full multi-colored bouquet of flowers. This is a visual and colorful effect that is self-working due to the mechanical components. This can also be done in a pot by the magician, or by an assistant without it seemingly being touched. Bouquet comes complete with 5 loose white flowers. Stalk is made of brass to avoid rust, and is covered with green feathers. All flowers (fixed and loose) are made of cloth for long durability. Great value and much easier to operate than other Birth of Flower versions.